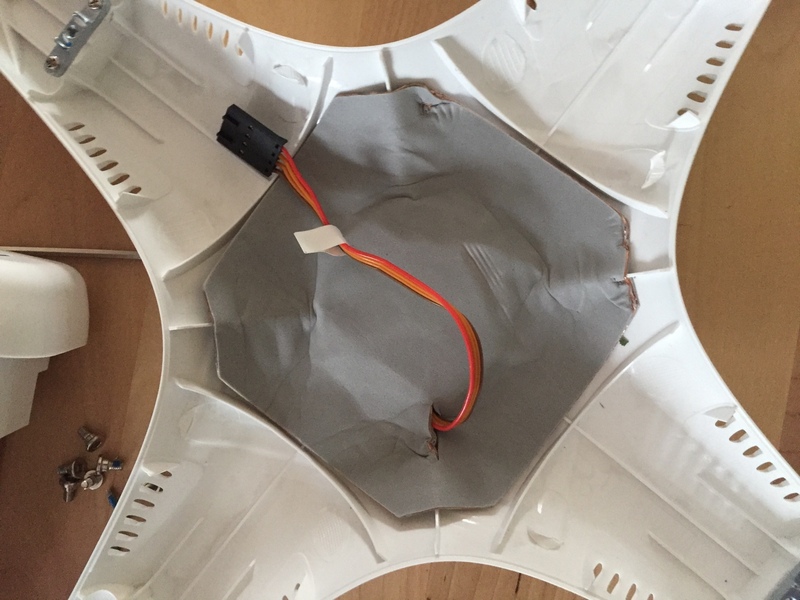 DJI Phantom 2 Help after Crash! I am new to this community but I hope to get some help with my problem. So here is my issue, I'll try to make it as short as possible: I have a DJI Phantom 2 (I know it's an old model but I love it) and I have never ever had any crashes or problems with it, before this weekend. I started flying the drone and got some solid shots in with the attached GoPro, while I was flying I noticed that the battery level of the drone was getting lower and lower, nonetheless I was not worried because the drone always gives a battery warning when it becomes critical (red Blinking? correct me if I am wrong on this). Unfortunately, that never happened, so the drone went into Auto- Land Mode but crashed into a tree on its way home. I checked the drone realized that a prop was broken, fixed that and thought everything was fine, wrong... This weekend I got out the drone did the start up procedure like specified in this thread (20 point start up procedure for Phantom 2 (non vision)) and took off. Immediately the drone started to wobble and drift, it wasn't able to correct its positions and any movement with the controller made it even worse. So I had to shut off the motors since landing was impossible while doing that I broke 3 propellers. As soon as I got home I connected the Phantom to my computer to make sure the software was up to date (I knew it was updated since I always keep it up to date), I also did an advanced calibration, made sure that everything else was in order and replaced the props. I then took off the gimbal to not damage it on further flight tests. I again did the start up procedure, took off and everything seemed to be fine. Until two minutes into the flight at low altitude, the same behavior (wobbly and uncontrollable) occurred again. The same thing happened after the next two flights, luckily none of the props got broken. When you say "advanced calibration" you mean the IMU right? I wonder if there isn't a fine crack in a connection somewhere? You might try inspecting the board and all connections with a magnifying glass. Also, I think it's time to retire that battery. Switch 1 defaults are; Top position - "GPS ATTI" mode, Middle position - "ATTI" mode, Bottom position default - "Failsafe"
By flying in ATTI mode you are trying to eliminate problems caused by the GPS controller functions of the hardware, if it will fly in ATTI mode without crashing then it will give you somewhere to start trouble shooting. Beware in atti mode the drone will not stay in one place when airborne, but will drift in the wind, it should maintain height OK. I have never flown the copter in atti mode, do I have to enable Naza mode in the assistant software on my computer to be able to do that? Yes the IMU. That's what I will do if all other tips fail. Keep is in mind that there is no ATTI in Phantom mode as that function is only available in Naza which also has IOC if you check the box. I can't understand anything from the first video, phantom is too far away. At the end of the second video in which mode GPS or ATTI was the phantom set...? If it was in GPS mode then there is something very wrong, possibly with the gyro's, yes I can understand some drifting could be caused by poor GPS lock or a problem with the compass, but to flip over like that in relatively no wind conditions it is worrying, the bird should be much more stable in GPS and in atti mode than that which can be seen in the video, remind me have you done an RC calibration, and was the advanced cal done in a place where there is no electrical interference, ( I never do it inside the house ). at the end of the video, the Phantom was in Gps mode but it acted similarly in Atti. When you say "flip" are you referring to the end of the video? If you are, the drone flipped because I shut the engine off mid-flight and as a result of that the Phantom flipped. I didn't want to break any further propellers with a shaky landing maneuver... Yes I have done an RC Calibration and no the ad. cal was done in my house, where it was always done and never caused any problems. When ATTI mode you have to control the flight with input from the controller whereas in GPS will hover in place without any input from you. I agree with Waylander's comment on the first video. From the little that could be used in the first video it look toilet bowl effect but that is associated with poor compass setup both with IMU and the compass it self. There is one component that can cause problems after a crash and that is a cracked GPS antenna. The GPS module is in top of the P2 shell the module is under a gray shield an held down by four screws which you have to remove to view the antenna opposite side of the board. Are you talking about this gray cover? Yes, Remove the GPS shield (that what it's called) an unscrew the 4 screws holding it so you can see the GPS antenna on the other side.